Experience a world-class massage at our relaxing, warm and welcoming spa. Enjoy an invigorating massage, or relax in our steam room or sauna. We offer traditional Swedish and Deep Tissue Sports Massage. Specialty therapies include Hot Stone Therapy using heated river stones. All of our Massage Therapists are experienced and certified. Whether you’d like to squeeze in a quick work out in our gym or relax and unwind in our sauna or steam rooms, the Aspen Alps Spa is an experience not to be missed. Click here for a full-service menu. You can always call (970) 925-8114 and speak to our Spa Attendants to book an appointment or for any questions you might have. 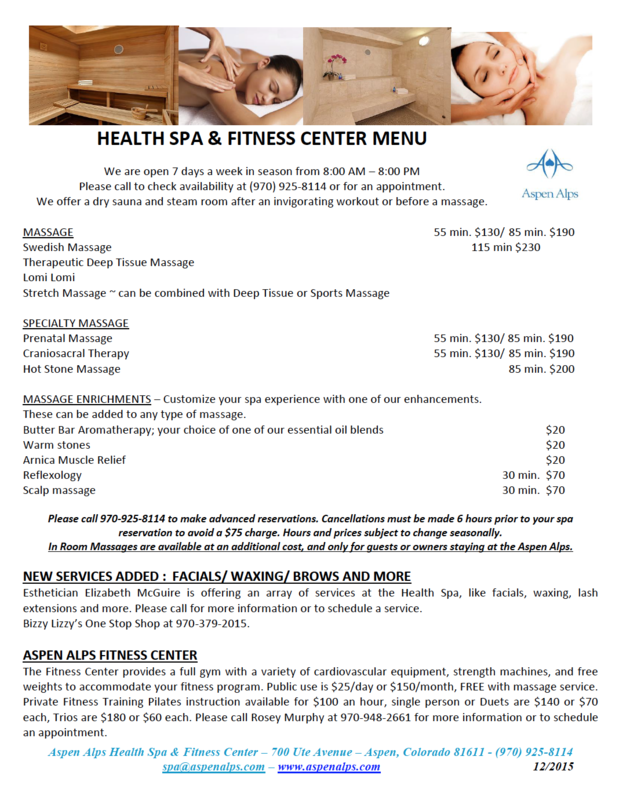 The Aspen Alps Heath Spa & Fitness Center is open all year. During summer and winter season, we are open 7 days a week from 8:00 A.M. – 8:00 P.M. Please call for our off season hours.